Would it be presuming of us to think that a few of you are reading this post in horizontal position? We are imagining you lying on the couch with a big bowl of Christmas food leftovers balancing on a pillow next to you and a pile of cookies on the sofa table? It’s how these days between Christmas and New Year usually are spent. And rightfully so, after all the holiday craziness it’s nice to just doze away for a while. But sometime soon you will probably start feeling for something fresh again. Regardless if it is tomorrow or next year, we’ve got the perfect recipe for you. It’s a true breakfast revelation, and such a pretty one as well. First time we tried quinoa bircher was at one of the many trendy Melbourne cafes, one year ago, and then again at Satan’s Coffee Corner (that name!) in Barcelona. 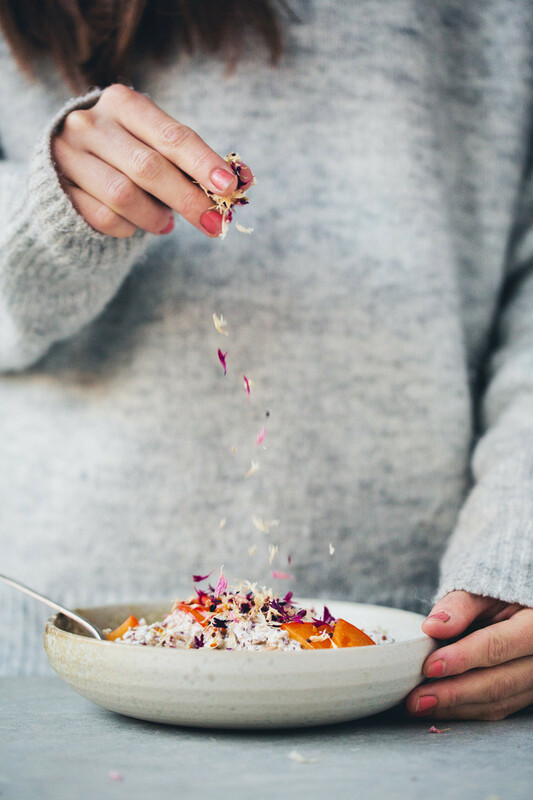 We knew that we had stumbled over something great and have since then been experimenting with our own quinoa/buckwheat/oat bircher recipes. 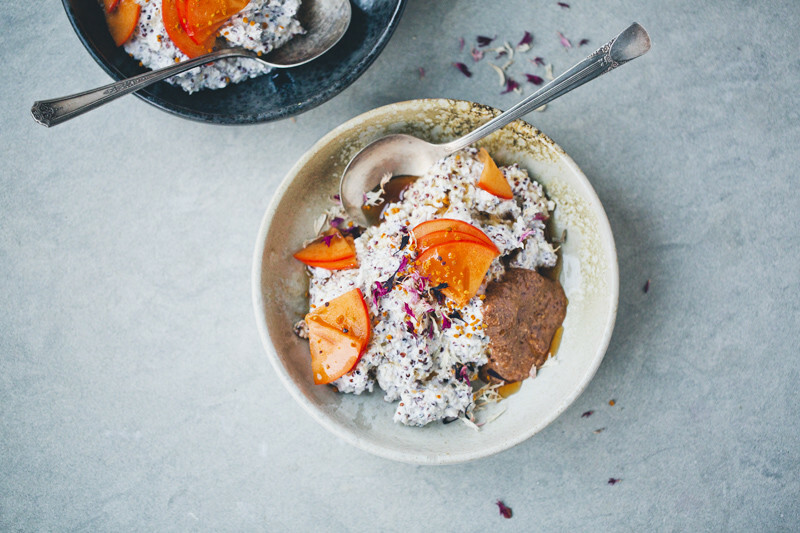 Simply explained, this bircher is made by mixing quick-cooked quinoa (making it more crunchy than mushy) with oats, yogurt (or coconut yogurt), vanilla and ginger. 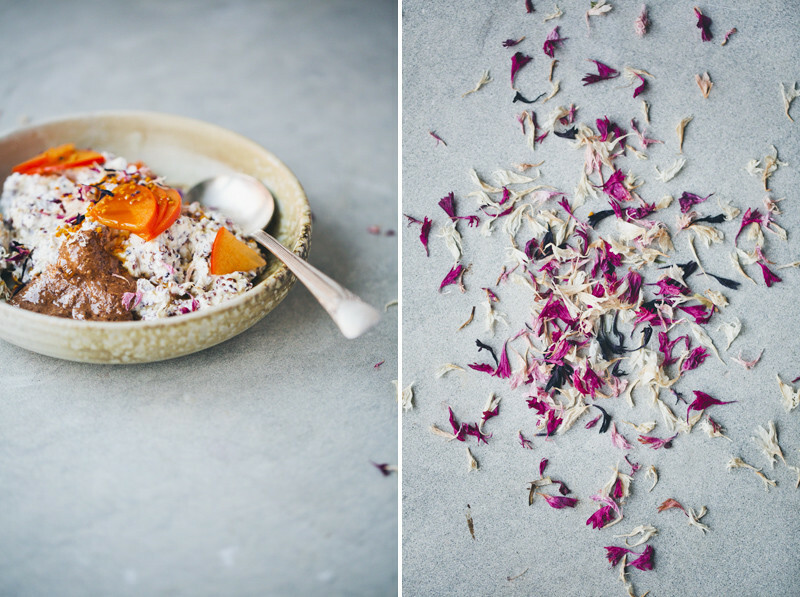 Then we top it with ripe persimmons, nut butter, bee pollen and these beautiful edible flower petals that we found at a local store. The result is a creamy and fresh breakfast that is super satisfying and really delicious. The petals actually taste surprisingly good – very flower-y – and suits this dish really well, but we mostly use them because they are pretty. If you can’t find any, feel free to make this dish without them. With this post, we also want to wish you all a happy end of the year and hope that you will get a great start of the next one! We are honestly so happy and grateful to have you reading our posts and trying our recipes. We have a bunch of special and exciting things (new book coming out!) for you in 2016, so stay with us. /David, Luise, Elsa & Isac! Quick-cooked quinoa: Place 1/2 cup rinsed quinoa, 1 cup water and a pinch of salt in a medium-size saucepan. Bring to a boil, lower the heat immediately to a bare simmer and let gently cook for about 8 minutes. The texture should be soft with a crunchy feeling (think al dente). Drain the excess water and set aside to cool in a mixing bowl. Combine the quick-cooked quinoa with oats and stir in yogurt, vanilla and ginger. 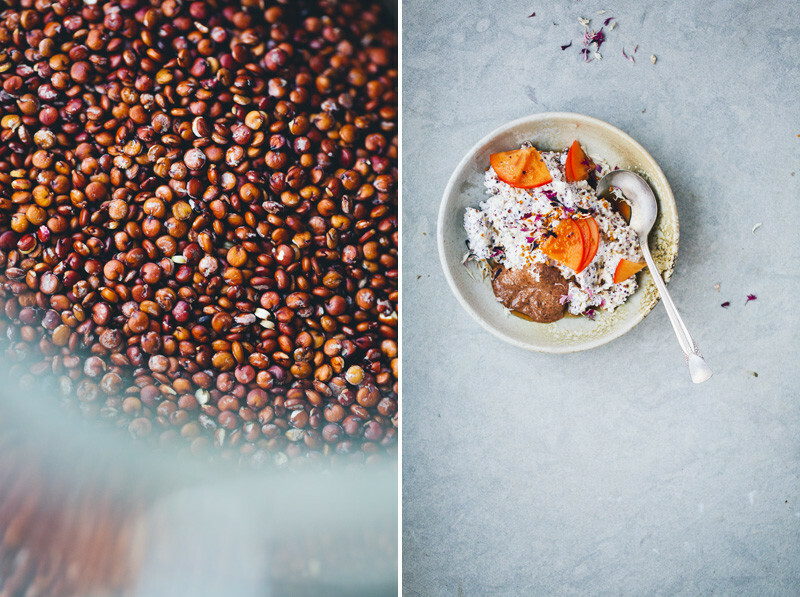 Serve in two large bowls or four smaller and top with thinly sliced persimmon, nut butter, bee pollen and petals. Drizzle over a teaspoon maple syrup if you prefer it a little sweeter. Store any leftovers in the fridge for up to 3 days. This recipe is ideal for preparing ahead stored in a sealed jar and then have the toppings added right before serving. PS! I’m suspecting that we’ll get some questions about the bowls. They are from Danish ceramics KH Würtz and they are just as gorgeous IRL. Oh, this looks gorgeous. One of my New Year's resolutions is to try out more techniques, ingredients, and ideas that are unfamiliar to me, and bircher is one of those, so I'll definitely be trying this out. Also, new book? I can't wait to hear more about this. I made this and topped it with cashew butter and blueberries. Holy Goodness! It is so delicious. Thank you for another amazing dish! I have never had the pleasure of indulging in a little bircher for brekky. . .but this quite possibly could be the most beautiful breakfast I have ever laid eyes on. Oh. . .and it includes all of my favorite ingredients. A must make. I love this, especially with the topping of persimmons and rose petals! However, as I am a bit sensitive to oats, I was wondering if you think this recipe would work without them? Thanks! 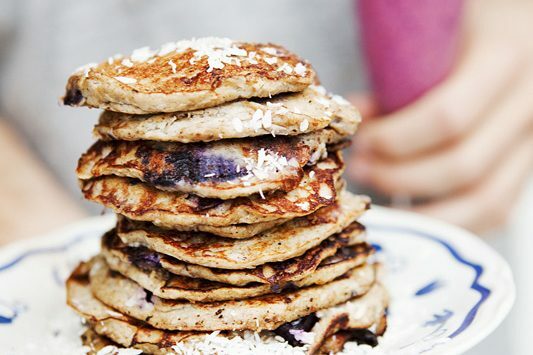 Beautiful recipe and photos as usual (: Makes for a filling, but not too heavy, breakfast. Just what I needed to drag myself out of bed for work after a lonely holiday weekend and a big snowfall (plus a power failure when it's already dark). I feel my days brightened every time I see a new post, be it on the blog or on your Instagram. Thank you for yet another delicious green and healthy year. Can't wait to see what 2016 has in store! Beautiful colors! And you even matched her nails and outfit to the food! Does this become easier to digest after it has sit for a while and the yogurt soaked into the oats and quinoa? I love persimmon, and I love quinoa! Sounds like a great breakfast to try! I recently bought your app, and I am so happy with it! I am such a picky eater (I want my food to be nutritious, delicious, healthy, and not make me gain weight. Is that so much to ask?? :) ) The recipes actually got me excited to cook, and use so many ingredients that I love, and not always know what to do with. Sometimes I tweak the recipes a bit, and then it becomes more "me". Thank you very much, and wishing you all all the best in the new year. Stunning photos! This definitely makes me want to try bircher. Yum! Such lovely photos! I've never had bircher before, but this certainly has me anxious to try it out. Yum! Beautiful recipe as always! 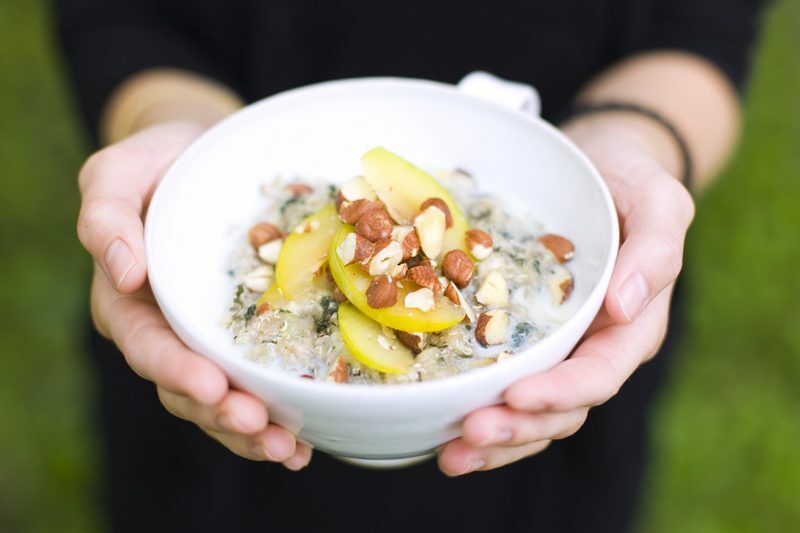 I've only tried bircher several times with oats, and it tastes wonderful! love it! just wondering approx. how many portions the above is? all the best for 2016, keep up the good work - you're a great inspiration! This looks really pretty you guys! Happy New Year! Cannot wait for your new book to come out! 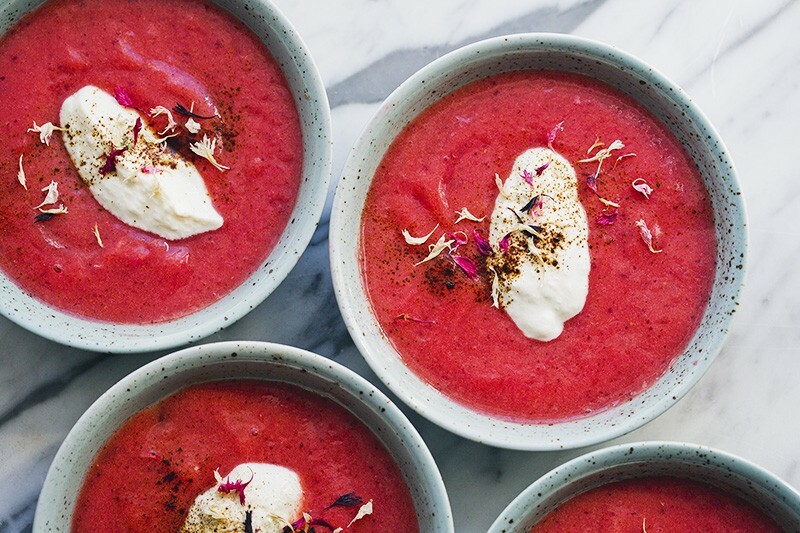 Whoa, this sounds delicious - and looks absolutely beautiful! Happy almost new year! g.
Hi! 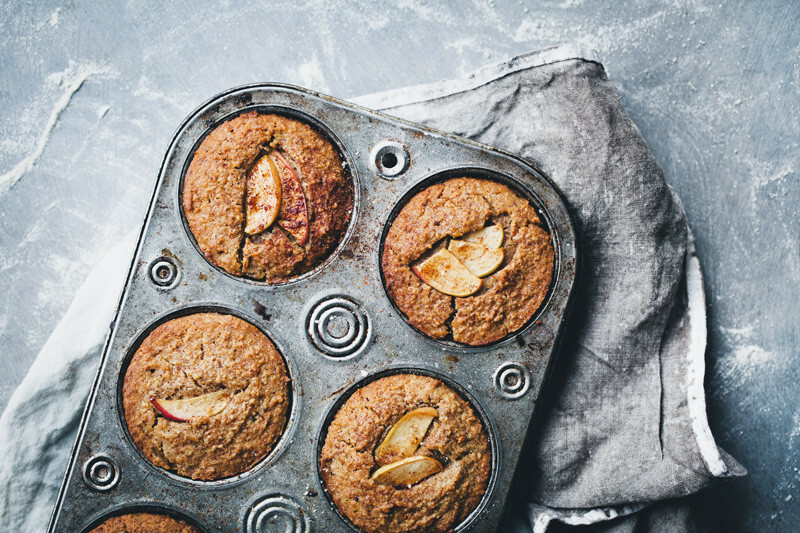 This looks like such a great, easy breakfast for work mornings. Quick question--are the oats cooked at all or are you eating them raw? Do you soak them for a time?